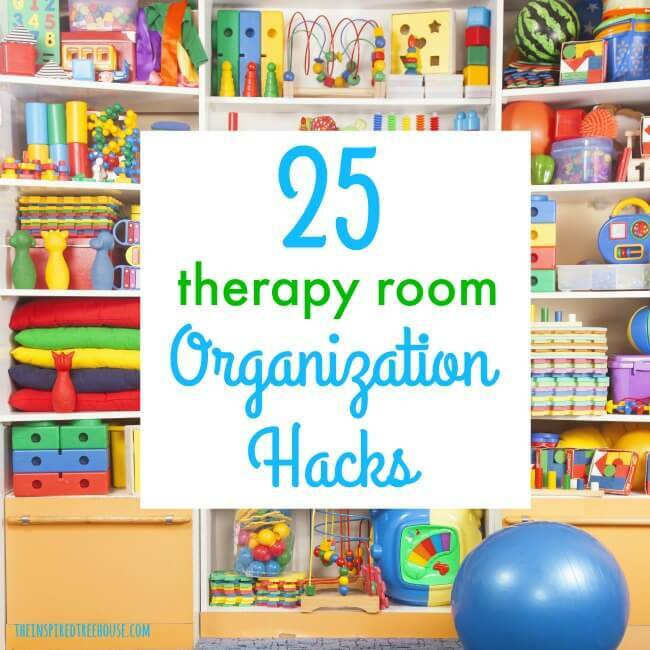 With the beginning of the school year looming on the horizon, it’s a great time to round up some awesome organization hacks and ideas for your therapy room! 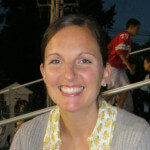 Many people cringe a little bit when they hear back-to-school talk at the end of the summer. But we therapists have a little Type A place in our hearts that squeals with delight when we start to see those colorful, pretty school supplies appearing on store shelves! We tend to be organizers, savers, labelers, and fixer uppers. We just can’t help ourselves! Whether you’re a school based therapist or you work in another setting, the ideas below are great for keeping therapy materials and equipment neat and organized all year long! 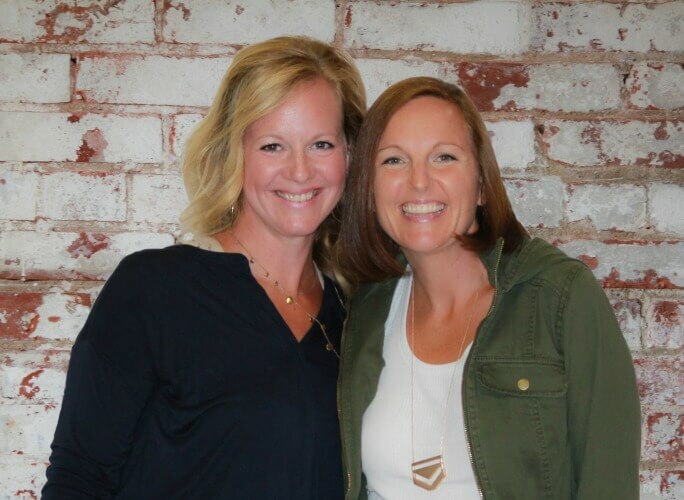 And if you’re drowning in paperwork, frustrated with documentation, and overwhelmed with scheduling and planning, we have something awesome to share with you! Check out our Printable Planner for therapists! With pages and pages of calendars, to-do lists, data sheets, treatment planning pages, and more, this awesome printable planner will keep you on top of your therapy game this year! Click here for more information! 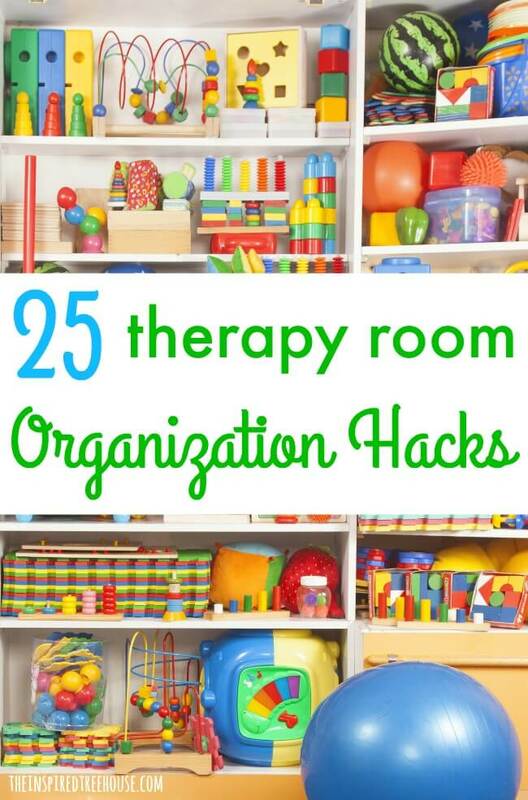 Here are some of our favorite ideas for keeping your therapy room organized this school year! 1 || Ball Corral (from The Family Handyman) – This awesome DIY project is meant for garage storage and organization, but how perfect would it be for the therapy room? Love how there’s space on the sides for smaller balls too! Brilliant! 2 || Stuffed Animal Chair (from Thread Riding Hood) – This little gem (or big gem actually) is as awesome as it sounds. If you have stuffed animals (or weighted stuffed animals), bean bags, or other plush toys floating around, why not turn them into an awesome squishy bean bag chair? A comfy seat plus storage all rolled into one! 3 || Painter’s Tape Parking Spaces (from I’m an Organizing Junkie) – We love this simple idea for keeping tricycles, bikes, scooters, push toys, and riding toys in check in the therapy room. And kids would love “parking” their vehicles when they’re done riding! 4 || Laundry Basket Dresser (from Ana White) – Okay, this one requires some handiwork and power tools, but wow. What an awesome and functional way to store larger supplies like balls, bean bags, and more! Love how you could take down a whole bin of toys and then quickly clean up and stow it away! Brilliant! 5 || Large Storage Bin – This lightweight mesh bin is meant for storing pool toys, but would also be perfect for sporting equipment, balls, and other large therapy materials. It’s on wheels too, great for repositioning and pushing out of the way in a small space. 6 || Caddy for Rolling Cart – If you travel between schools or other locations, a rolling cart is your best friend for transporting files, supplies, toys, and games. This caddy that slips over your rolling cart has lots of great pockets and compartments to keep everything organized when you’re on the go. 7 || Car Organizer – Sometimes we therapists end up living out of our cars during the school year. We scramble from one building, one meeting, one home to the next – usually eating meals and taking calls along the way. This awesome car organizer can help keep everything in check so your car doesn’t end up looking like a complete mess! 8 || Trunk Cargo Organizer – Now that the front seat is all organized, it’s time to tame the disaster that is your trunk. We know what it looks like in there, and it’s not pretty. Tired of listening to all of your therapy supplies roll around your backseat or trunk? Check out this great organizer that will help you grab what you need quickly without having to dive headfirst into your trunk (we’ve been there). 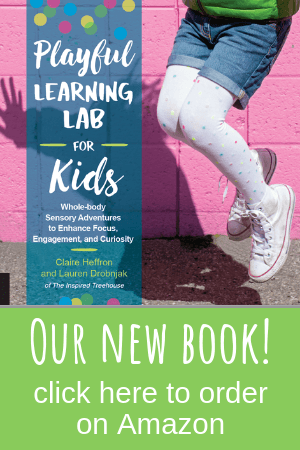 10 || Sensory Bin Filler Organization (from 1+1+1=1) – Finally! A way to keep all of those messy sensory bin fillers neat and organized! Forget storing sand, dry rice, or dry beans in freezer bags. Ever had one bust open on you? Yep. Same here. Never again. This storage system is too perfect. 11 || DIY Toy Storage (from Designer Trapped in a Lawyer’s Body) – Storage containers have to be functional, but it doesn’t mean they can’t be pretty too! This super cute DIY idea would be perfect for storing small toys, pencil grips, erasers, and other little odds and ends while also adding a splash of color to your therapy room! 12 || Mesh Bag Toy Organization (from Two Twenty One) – Ever seen a kid’s face when they complete a puzzle, only to find that one piece is missing? Sheer disappointment. This great idea ensures that pieces stay with their puzzles, Mr. Potato Head’s facial features don’t stray too far from his body, and beads stay with their strings. 13 || Soap Box Organizers (from Shady Tree Diary) – Love this simple storage/organization idea. These handy containers are perfect for storing decks of cards, beads, craft supplies, and other small pieces! 14 || Plastic Tote – Here’s a great little lightweight tote that could hold resistance bands, containers of playdough and playdough tools, or any other small to mid-sized therapy item. Check out this cute organization setup from I Heart Organizing. Love how it’s all color coordinated! 15 || Printable Toy Labels (from The Handmade Home) – Print these puppies out and use them to label any organizing and storage containers you have in your therapy room or classroom. They’re free! Woot woot! 16 || Clothespin String Storage (from Factory Direct Craft) – Do you have a tangled mess of strings from lacing cards, beads, and other craft projects? With this simple idea, you won’t have to spend 10 minutes before your therapy session unknotting and untangling them! 17 || Paper Storage (from Teach With Me) – This paper storage technique makes my Type A heart swoon and lets you quickly grab whichever color you need! 18 || Tote/Organizer – This cute little tote is designed for tools, but I could definitely see it being used for pencils, scissors, glue, and more! 19 || DIY Tote (from DIY Joy)– Or, you could totally make your own little craft tote! Love this simple idea for art supply storage! 20 || Art Cart (from Suburble) – This little beauty is perfect if you’re working in a small space…and let’s keep it real, most of us school based therapists are working in closets and hallways, am I right? Love how pretty and portable it is. 21 || Painted Pencils (from Hello Glow) – Going back to school can be tough. That’s why you should paint your own pencils. It will make your heart a little happier when you put your handful of personalized, color coordinated pencils in your pencil holder! 22 || Binder-Clip Cable-Keepers (from Wired) – Keep that tangled mess of cords from your phone charger, computer charger, and iPad charger in order with this cheap/free organization hack! 23 || DIY Paper Organizer (from Hometalk) – Most of us don’t have an unlimited budget to work with as we set up our therapy rooms/offices. DIY ideas like this one are the perfect way to clear the clutter without breaking the bank. The perfect little spot to store work samples, pending evaluations, and therapy catalogs. 24 || Binder Clip Labels (from The Classroom Creative) – Besides being adorable and hilarious (the one that says “Hot Mess” cracks me right up), these free printable labels are a super simple way to organize those piles of paper floating around your room! And they make it easy to toss a stack of papers in your bag to take home! 25 || Back to School Caddy (from Aunt Peaches) – Here’s another cool DIY way to keep that paper clutter organized. There’s also space for pencils, markers, and more! Oh, and it’s adorable! How do you keep your therapy room neat and organized all year long? We’d love to hear! Leave us a comment below!